It has once again returned to strong growth after a brief hiatus, spurred by the return of investors' confidence (and cash) in India's online food ordering sector. As Zomato brought in its tenth anniversary celebration on Tuesday, there were no parties at its offices, nor was there any alcohol for employees to let loose and enjoy, as had been its tradition over the previous nine years. This, however, wasn't a sign of austerity, but show of a company that was growing up. While Zomato has seen its fair share of ups and downs, it's 10th birthday celebrations certainly come when the company is on a high. In a blog post, Deepinder Goyal, co-founder and CEO of Zomato, spoke about a vision for the company that's beyond anything that it does today. “We are already taking baby steps towards being the biggest farm to mouth food company in the world, and there is so much to do for all of us,” he wrote. In a town hall, Goyal announced to employees that the company would get into the business of delivering raw materials to restaurants sourced directly from farmers. Restaurants who used this service would get a certified tag from Zomato, alerting its users that the restaurant was using quality ingredients. He said, in 10 years, he saw Zomato even delivering raw materials to customers at home. Zomato is also planning an entry into organising events. Chaitanya Mathur, co-founder and director of Grub Fest, which organises India's largest food festivals, will be joining Zomato to drive this unit. Goyal announced a $100,000 annual reward (in stocks) for employees who display the qualities of a founder. Helping people order food online and go to restaurants might be just a small portion of Zomato's vision for the future, but for now the company knows it has to drive the core business. In the past 12-18 months, Zomato has scaled up its delivery network, onboarded more restaurants onto its platform and has launched loyalty services. 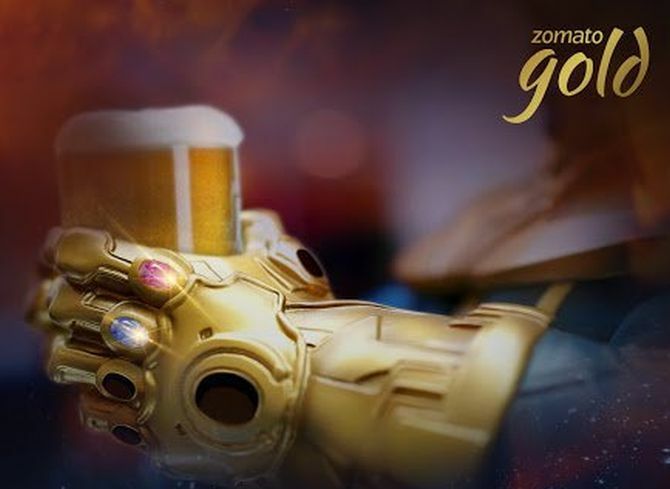 Zomato Gold, the company’s loyalty programme that offers customers one free meal with every meal they order at a restaurant and two free drinks for every two drinks they buy, has seen quite a lot of success. For frequent restaurant goers, the Rs1,679 that Zomato charges for a 12-month Gold membership doesn't seem to be a big price to pay. On Tuesday, Zomato launched Piggybank, a rewards plan to get customers to order food online more frequently. By offering a discount of 10 per cent on every order in the form of reward points worth the same amount in money, it is trying to get customers to come back to it the next time they want to order in, and not to its rivals. However, this recent success has come at a price. After Zomato burnt through money chasing dominance in the restaurant discovery market globally, it hit a rut in late 2015. In Goyal's much-publicised letter to employees in late 2015, he spoke how the company had for the first time failed to hit its growth targets. This was followed by a round of layoffs and scaling down of its overseas operations. Around the same time, the bubble of food-tech players in India came crashing down, serving as a double whammy for Zomato, which after attaining the status of a Unicorn (valued at over $1 billion) started facing difficulty in justifying its valuation to investors, who were shaken by the spate of closures in India's food-tech space. Against all odds, Zomato did bounce back and even raised $150 million from Ant Financial, an affiliate of China's Alibaba, in February this year, but at a valuation of $750 million. InfoEdge, the biggest investor in Zomato, in a filing to the Bombay Stock Exchange, notified its investors that it was selling 6.7 per cent stake in Zomato to Ant Financial for just $50 million. While it might be true that valuations are not the endgame, for Zomato to win and build itself into the business it wants to be, it has to still outperform its rivals. Swiggy, has emerged as an equally well-funded and nimble rival, and there's the twin threat of giants Uber and Ola (through Foodpanda) that have their eyes set on capturing India's online food ordering space.